Jackson, Belle nee Crawford. November 6th 2018. Peacefully at Marie Curie Hospice, Belfast. Late of Church Drive Bangor. Dearly loved wife of Gordon and much loved mother of Ian and Pauline. Service in First Bangor Presbyterian Church on Friday at 12.00noon. Funeral afterwards to Clandeboye Cemetery. Family flowers only please. 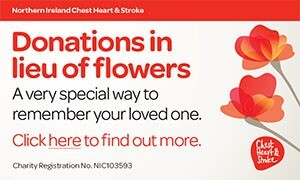 Donations may be sent if desired to Marie Curie Belfast c/o S. Clarke & Son, Funeral Directors, 64 Newtownards Road, Bangor, BT20 4DR. Will be sadly missed and lovingly remembered by her husband, son, daughter and grandchildren Harry and Sophie. a beautiful memory left behind. All our love from daughter Pauline and grandson Harry. but in my heart you will always be there. I am sorry to tell you that Belle Jackson has passed away.